It's been a busy few weeks for game releases and it's just going to get busier! 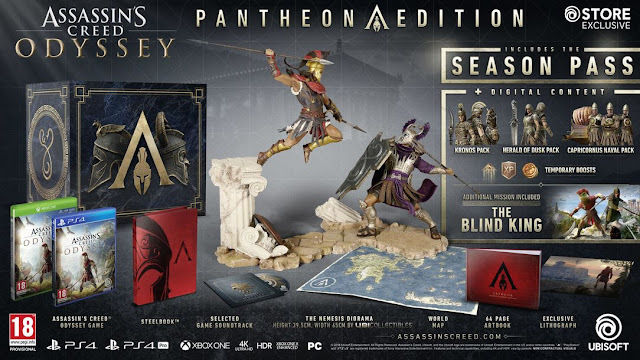 Assassin's Creed Odyssey is just around the corner and Ubisoft have released a trailer for their biggest & baddest Collector's Edition, the AC Odyssey Pantheon Edition! A couple of months back, I shared on the blog details about the various editions and collectibles that were being released for AC Odyssey..
And if you noticed.. it stated that the Alexios figurine in the diorama above can be swapped out for the Kassandra standalone UbiCollectibles figurine.. So here's how it looks.. Cool stuff eh? That's definitely interesting if you ask me.. Definitely some swap out options if you prefer one over the other. If you haven't gotten yours yet.. check out the affiliate links below! Affiliate Links may earn this blog a commission, if you click and purchase through these links, at no additional cost to you.